At the start of this 21st century, exploding demand for all things Internet fueled the corresponding response of the tech industry in the form of new devices, networks and services to keep us connected, all of which generated a tsunami of social and economic change that continues unabated today. 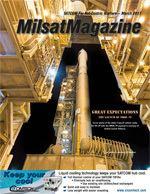 Plan for the Worst... And Hope for The Best, By Garret C. Hill, Chief Executive Officer, X2nSat, Inc.
With the launch of new high capacity, Low Earth Orbit (LEO) satellites that migrate across the sky, and the increasing importance of high speed communications from moving vehicles, ships, or planes, the need for accurate tracking between the satellite and its ground terminal remains as important as ever. X-band satellite communication is widely used by the US and other militaries because this portion of the RF spectrum provides overall performance advantages that other bands do not. Flexible Next-Generation FDMA Technologies Driving Big Cost Savings, By Tony Sewell, Senior Manager, Product Management, DataPath, Inc. The increasing demand for satellite communication links has led to an increasing number of satellite signals as well as an increase in the amount of interference as a result of poor installations and misdirected antennas. In a competitive environment, businesses strive to be more innovative and work harder to make their budgets stretch further—this same ethic applies to government departments and emergency services agencies, particularly today as they are called upon to get involved in ever more diverse operations and crises.